Today’s Great Eastern Run was a record-breaker on two fronts. There was a record entry of 5,100 athletes for the city’s big half-marathon and the winner smashed the course record. For the sixth year in a row it was a Kenyan who crossed the line first and Philip Koech, a tiny 28 year-old, hit the tape in a sizzling 61.40 to break the record of 62.16 set by fellow Kenyan Edwin Kipyego in 2010. It was a brilliant performance by Koech, who was having his first race in the UK, as he revelled in the near-perfect conditions. Koech won a big international 20k race in Morroco in March but otherwise his racing experience has so far been confined to Kenya. He won the Safaricom Kisii Half-Marathon - regarded by most as the Kenyan Half-Marathon championship - early in the year in a cracking 62.54 and that was his personal best for the 13.1-mile distance before today. For that he not only received a prize of 70,000 Kenyan shillings (about £400) but the sponsors also rewarded him with cows, goats and sacks of maize. Today he collected a winners’s cheque of £750 and a trophy and according to Tom Payn, the manager of Koech’s RunFast team, he looks set to go on to win many more lucrative prizes. “We have about 50 athletes on our books - mostly Kenyans and Ugandans - and they are generally what we call development athletes,” said Payn. “We bring them over to give them experience of running in UK races to get good times and then hopefully that will gain them entry to some of the big European races. “Then if they can get below 61 minutes they will start to attract big appearance fees for races all over the world. “Philip clocked a very good time without really being pushed so I think we’ll be seeing much more of him in big races. Koech had company for the first half of the race from RunFast team-mate Ben Siwa, a Ugandan who won the previous weekend’s Cardiff Half-Marathon in a personal best 62.07 and who was third in the Great Eastern 12 months ago. But after about seven miles, Keoch kicked and a gap between the two developed. At the finish that had stretched to a minute with Siwa (26) clocking 62.40. Third was another Kenyan, Declerk Onyambu, and the 34 year-old finished in 65.14 in his first race on British soil. Kenya also took the ladies race spoils with late entry Lenah Jerotich romping home well clear in 73.02. The 27 year-old was the in-form runner in the field, having won in Cardiff the previous weekend in 71.32, and she finished two minutes ahead of runner-up Jane Murage, another RunFast Kenyan. Third in 76.05 was British runner Hayley Munn from Clapham Chasers denying RunFast another 1-2-3 as Demaris Areba (RunFast, Kenya), who suffered a bout of cramp towards the end, finished fourth in 78.28. The women’s course record of 72.14 was set by Liz Yelling in 2011. First British runner home in the men’s race was Alistair Watson, a 38 year-old from Notts AC, who finished fourth in 67.18. His clubmate Matt Blunden was fifth in 68.53. Top local was the fast-improving Anthony Johnson from Werrington Joggers. The 26 year-old only took up running three years ago to lose a bit of weight, and gets better with every race. He finished ninth in 70.06, which was an improvement on his previous best by two minutes and which broke the five year-old Werrington Joggers club record of 70.50 set by Paul Halford in 2010. Steve Robinson of Peterborough Athletic Club was just behind him in 13th place in 70.29. Wheelchair winner was Matt Clarke. 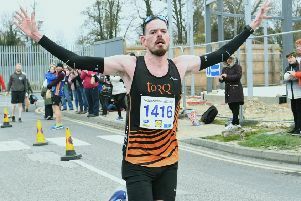 The 39 year-old from Scunthorpe whizzed round in 57.59 to make up for the disappointment of missing out in 2012 when he punctured at nine miles. The junior fun run winners were 15 year-old Cameron Everist from Bourne Town Harriers (boys Under 16) and 13 year-old Amelia Monaghan of Nene Valley Harriers (girls Under 16).